Since we’ve noticed a relatively increased interest in our English written texts about Romanian wines, we thought to come up with some useful and also funny stuff – the pronounciation of some Romanian wine terms. We begun with the Romanian native grapes and some Romanian regions. All the following names should be pronounced with a non-rhotic accent, such as Scottish English, meaning terminationas such as “er” should be read “ə” instead of “ər”. Do you think we should make a video about this? 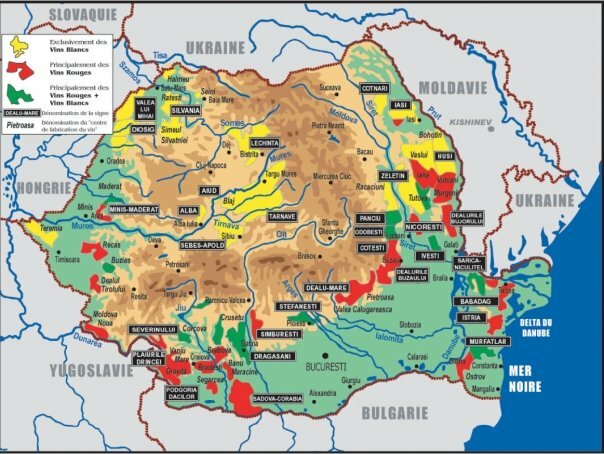 Below you’ll find a map with all the wine regions of Romania. stii cumva daca este vreo legatura intre Plavac (vin local din Croatia) si Plavaie? Intre cei doi struguri nu este nici o legatura. Plavac e un soi de strugure rosu, aparut din incrucisarea soiurilor Zinfandel (sau Crljenak Kaštelanski) si Dobričić, cultivat in Croatia. Plavaia e un soi de strugure alb, prefiloxeric, cultivat in special in zona Vrancei. da, clar nico legatura! nici culoare si nici zona.